Heads of state and thousands of war veterans gathered in France this weekend to mark 60 years since the D-Day invasion of Nazi-occupied Europe. Queen Elizabeth II travelled to Normandy along with 16 other leaders including, for the first time, a Russian and German head of state. As they met in Arromanches for the main international ceremony, a warship fired a 21-gun salute. About 250,000 died in the 80-day battle for Normandy after 6 June 1944. Veterans marched under sunny skies past the leaders seated in Arromanches to the strains of the theme music for the D-Day film The Longest Day. French President Jacques Chirac decorated Allied veterans from across the world with the French Legion of Honour. He went on to make a solemn speech in which he advocated the "humanistic values of respect, justice, dialogue and tolerance for which they gave their lives". The international part of the events in Arromanches was closed by military parades including a spectacular flypast by modern Nato warplanes and a naval review. In the morning, a salute was fired out to sea from the cliff tops above Omaha Beach, where US troops suffered heavy casualties. Wreaths were laid in the vast war cemetery nearby at Colleville, at a ceremony attended by US President George W Bush and Mr Chirac. 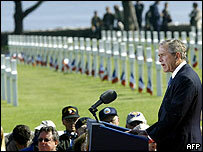 Mr Bush told veterans they would be honoured "ever and always", adding: "America would do it again for our friends." America, said Mr Chirac, was France's "eternal ally". 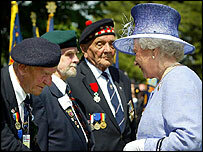 The Queen visited the British cemetery in Bayeux, along with Prime Minister Tony Blair and Mr Chirac, after meeting Canadian and British veterans at Juno Beach. After the main event in Arromanches, hundreds of British veterans marched before the Queen in the centre of the small town. "What for you is a haunting memory of danger and sacrifice one summer long ago, is for your country, and for generations of your countrymen to come, one of the proudest moments in our long national history," she told them. "I take it upon myself to express the immense debt of gratitude we owe to you all." A massive security shield was erected around Arromanches with at least 15,000 French police and troops deployed in Normandy for the occasion. German Chancellor Gerhard Schroeder warmly embraced Mr Chirac and was applauded by spectators when he arrived in Caen. He earlier said the Allied achievement had been not a "victory over Germany, but a victory for Germany". 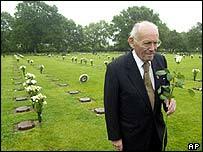 Mr Schroeder visited a mixed cemetery at Ranville, avoiding the main German graveyard at La Cambe, where soldiers of the notorious Waffen SS are buried. Russian President Vladimir Putin is also in Caen - the first Russian, or Soviet, head of state to attend a D-Day commemoration. No invitation was issued for the 50th anniversary in 1994 and the omission caused deep bitterness in the ex-USSR, which inflicted by far the heaviest losses on Nazi forces at great human cost. 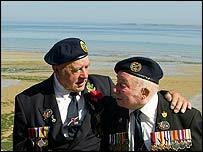 BBC Royal correspondent Peter Hunt said the Arromanches parade by old soldiers, many of whom are in their eighties, was being referred to as the Normandy veterans' "farewell march-past". "You look at the [grave] stones and they're all young," UK veteran Joe Kitchener said at Pegasus Bridge, scene of a daring airborne raid at the start of the landings. "You never see them as old men like we are." In Bayeux, the UK Chaplain General, David Wilkes, said in his address that D-Day was for many of the veterans a harrowing day never to be forgotten. "There are some veterans in this service who remember because they cannot forget," he said. "Their lives were shattered by their experiences. We dare not forget." "This is the last of the great D-day commemorations"